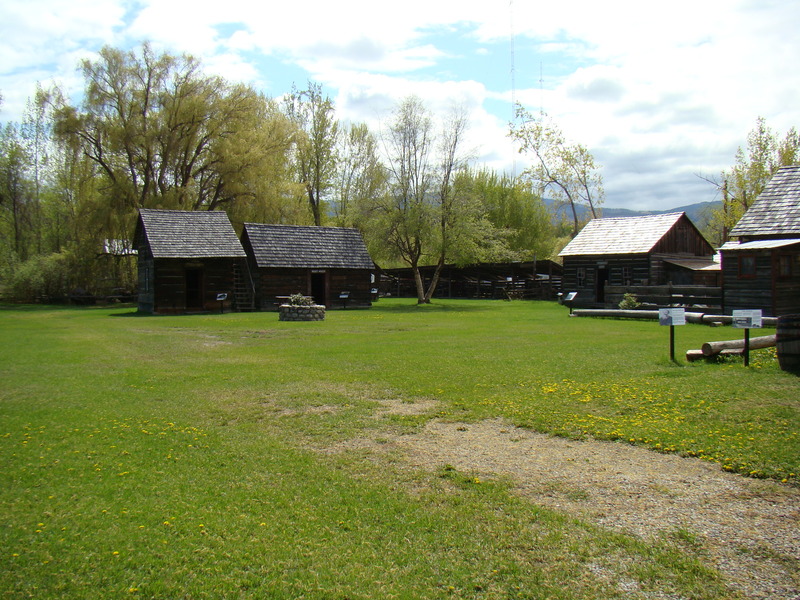 Bob took us to a pioneer mission heritage site in Kelowna. I was very glad to see that they had preserved their history. I love these kinds of villages, they really make the history come alive! They had signs explaining the restoration and giving more information about each building and its uses. 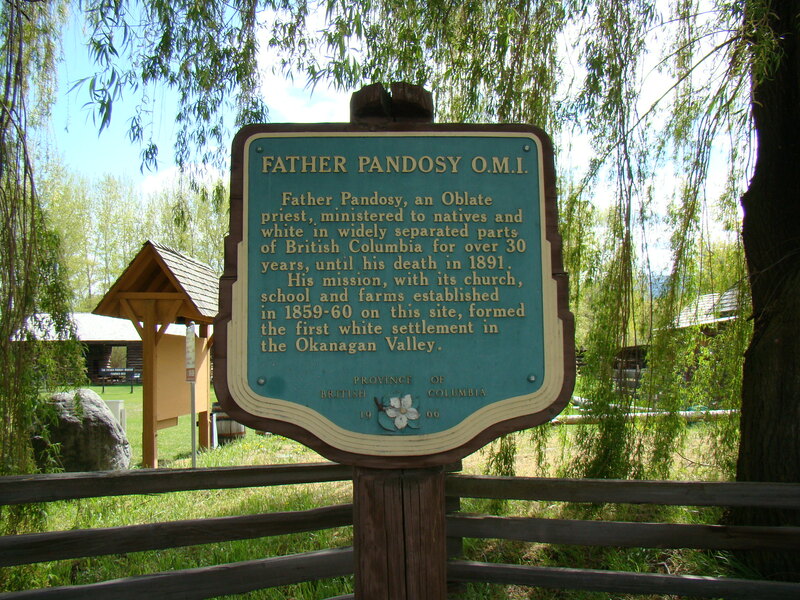 This entry was posted in British Columbia, British Columbia 2012, Kelowna BC, PAST GENEALOGICAL RESEARCH TRIPS and tagged Kelowna BC, Pendosy Mission Site on May 8, 2012 by BJ MacDonald. 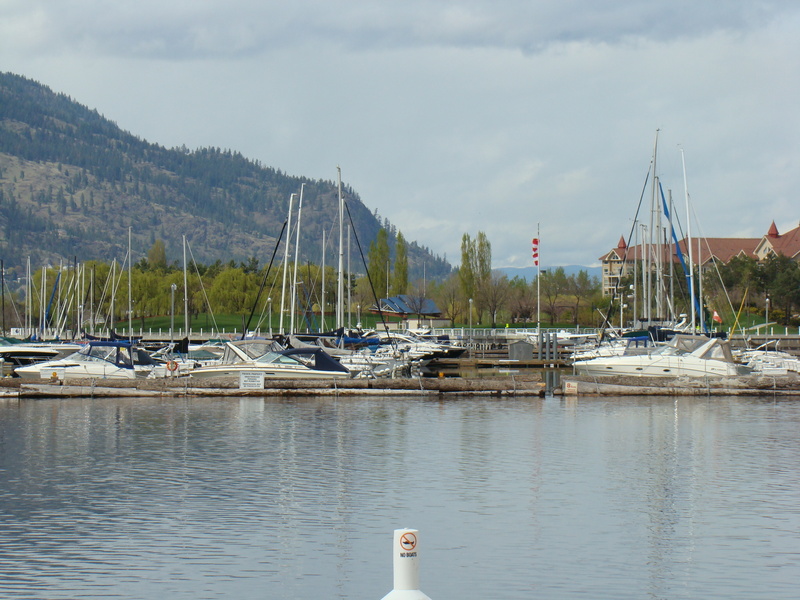 Okanagan Lake – A Tour! 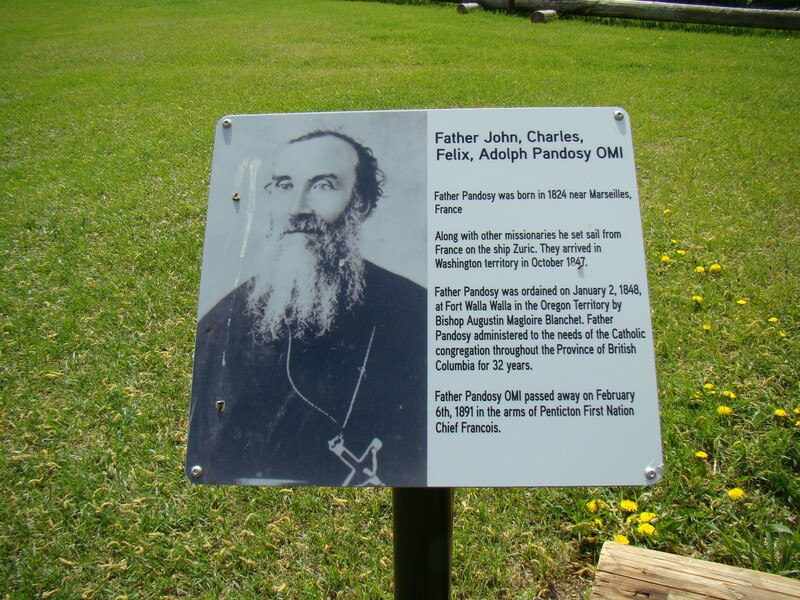 Sometimes it is good to take a break from genealogy research and just take time to enjoy the area you are visiting and learn about its history. As we drove along I contemplated the question of what brought people to this area? 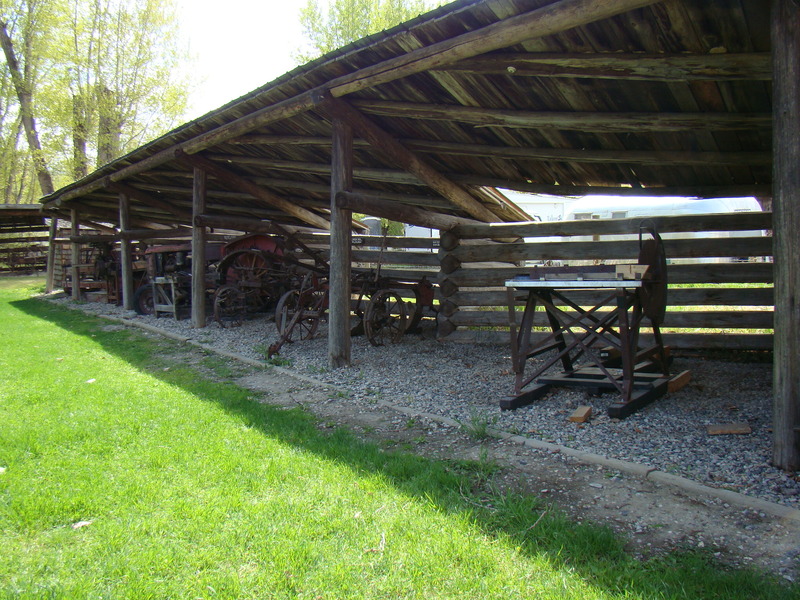 In the case of the Clements, William Clement had tuberculosis and the air in the Okanogan Okanagan is dry. You can almost drive around Okanagan Lake but not quite. There is a stretch on the southwestern side above Naramata that is rough. You would need time and a 4 wheeler as I understand it. 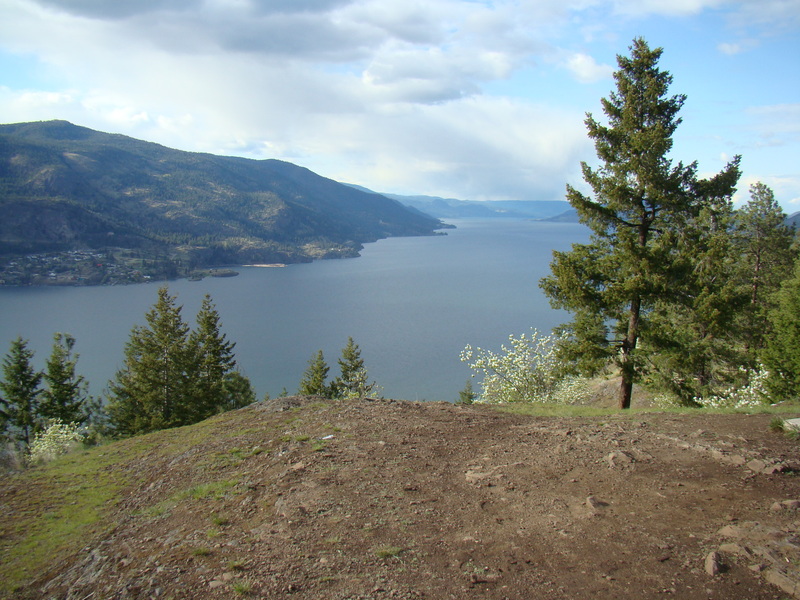 The Okanagan valley was carved by glaciers and old extinct volcanoes. 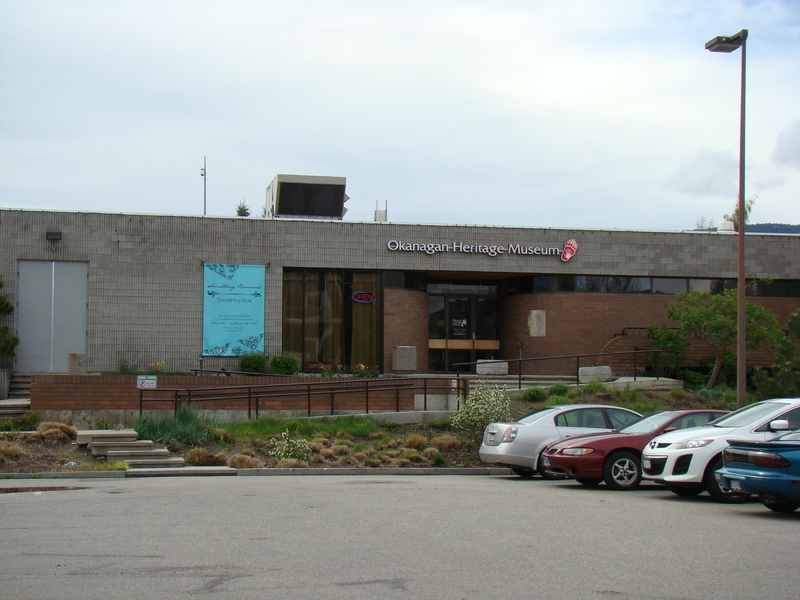 A visit to the Okanagan Heritage Museum in Kelowna can give you an overview of the area. They have an archive in the basement but you have to fill in paperwork and make an appointment.  I don’t know what is in this archive so you will have to do some digging. Our tour of the lake started in Lake Country on winding roads by the lake. They have the Lake Country museum. We did not have time to investigate this but check out the website. 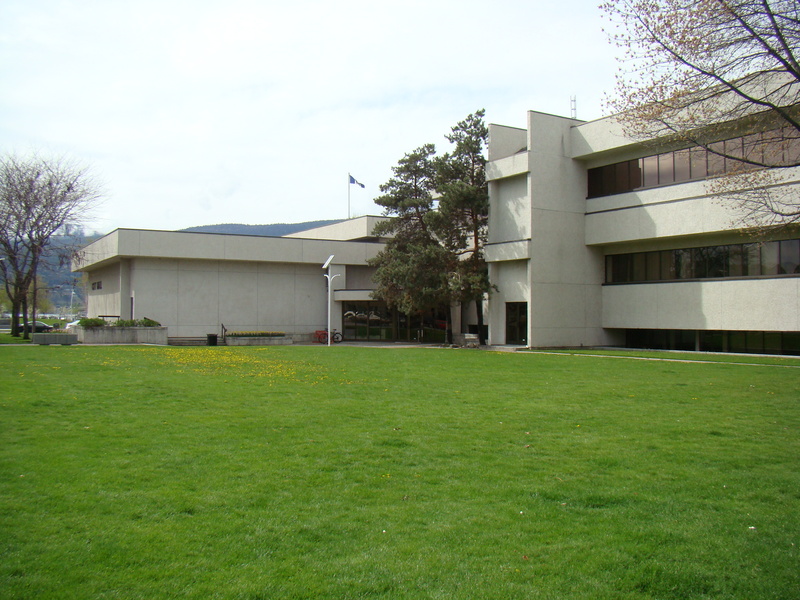 You can go north from Kelowna through Vernon where you will find many murals on the walls of the buildings. You then arrive at Armstrong a lovely town at the head of the lake that has the wonderful Village Cheese Company Store. It will take you some time to decide which cheese to purchase there are so many options. You can have a sandwich or an ice cream as well or do a little shopping. The east side highway along the lake is several lanes and easy to drive going north. My cousin Bob decided to take us along the west side of the lake which is a two lane highway up on the side of the hills along the lake. It is very steep in this area and a long way down to the lake. It is a winding road and it takes a little time to drive it. It is very pretty with great views of the lake, the homes on the lake for both sides and the surrounding areas. Well worth it but please be careful for it is known for fatalities. This road will take you over the bridge back to Kelowna. 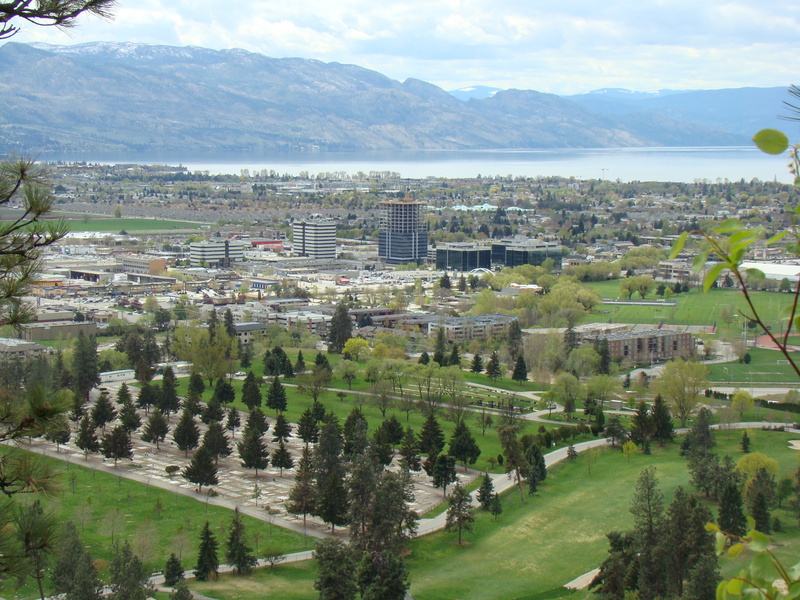 You can also drive through West Kelowna and head south on the western side of the lake and visit Peachland, Summerland and then Penticton at the end of the lake. The highway at the southern end of the lake is right on the lake with hamlets that you can explore. There are these very interesting bluffs along this drive. The highway curves around to Naramata but that is about as far as you can go, as I mentioned above. All of Okanagan Lake is wine country. 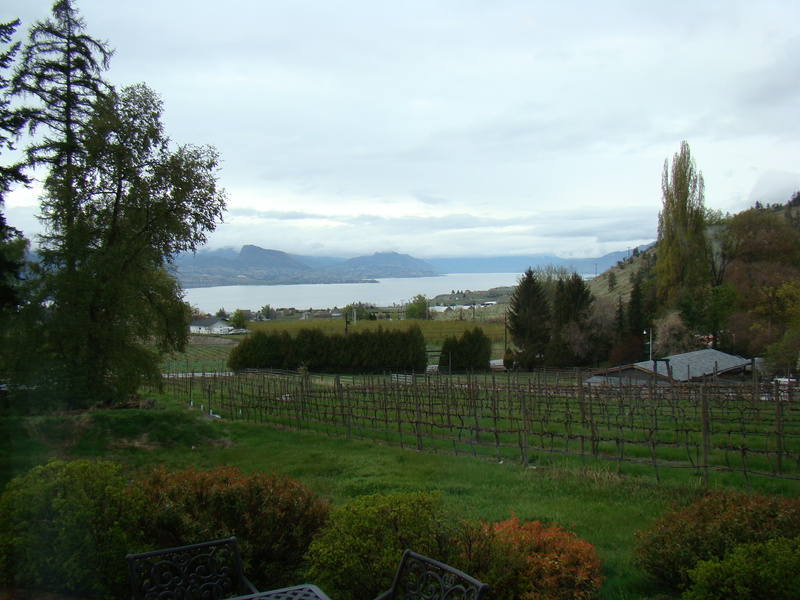 You could spend a great deal of time investigating the various wineries along the lake from the northern to the southern tip and it might just take a lifetime. There are signs every where pointing to this winery and it can take a little wiggle waggling to get to the winery. 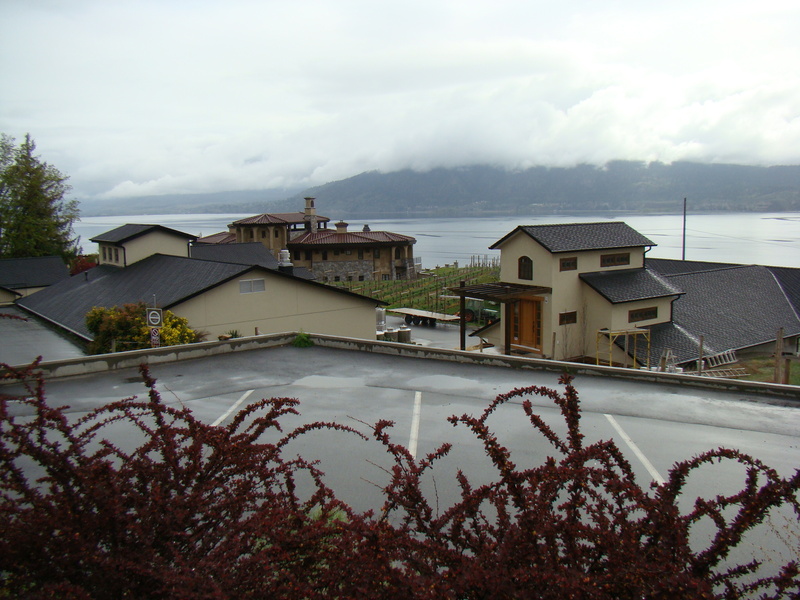 Many of these wineries are right on the lake and have some beautiful views. They are just starting the Wine Festival which goes on for several weeks. Note: Much to my surprise and embarrassment I have been mispelling Okanogan. It should be Okanagan. Hopefully I have fixed my mistakes. I do try! 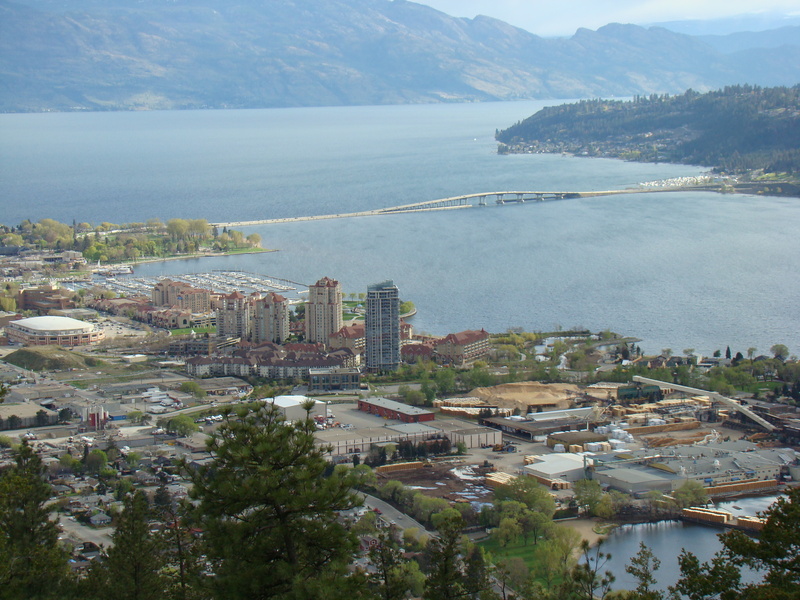 This entry was posted in British Columbia, British Columbia 2012, Canada, Kelowna BC, PAST GENEALOGICAL RESEARCH TRIPS, The Okanagan in British Columbia, Updates and Corrections and tagged Kelowna BC, Naramata, Okanogan Lake, Okanogan Wine Country, Peachland, Penticton, Summerland on May 7, 2012 by BJ MacDonald. Since arriving in Kelowna we have been busy visiting with my cousin and touring around. 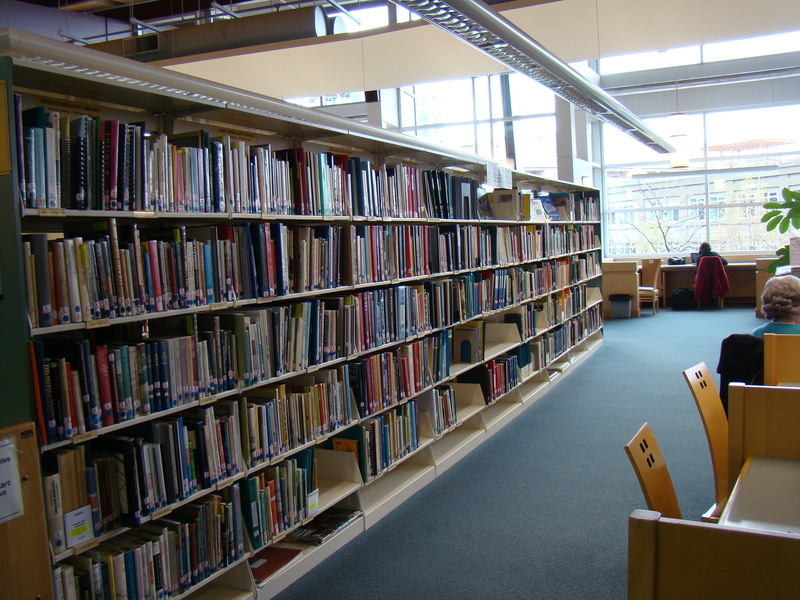 Kelowna has a genealogical society and they have their collection in the relatively new library on the second floor. 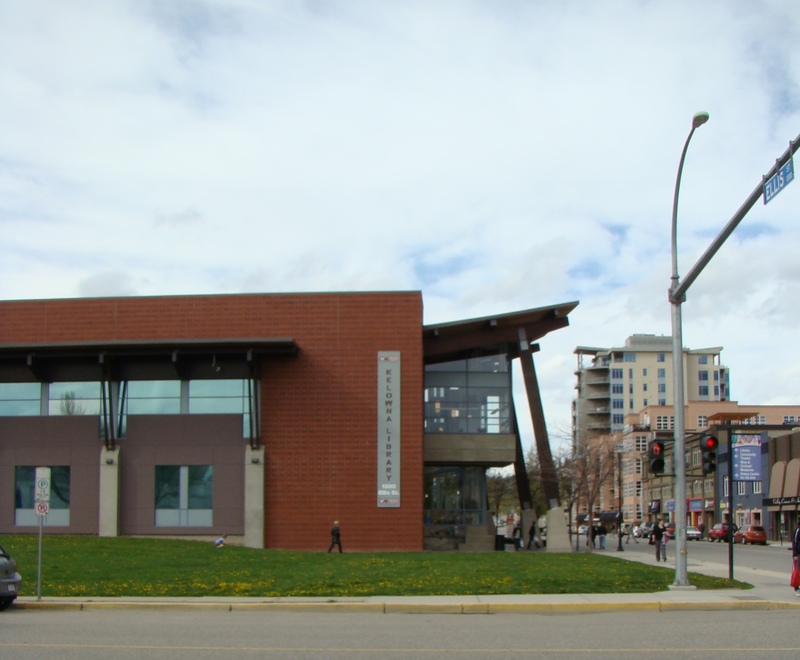 Kelowna Public Library is located at 1380 Ellis St., Kelowna BC and is worth visiting. There is a parking lot across from the library so that makes it easy to find parking. I spent my time at the library pulling books off their stacks mostly on the McDonald side. They had two volumes of the St. Andrews West church records so I took a look at them. They had several volumes of the books on the Abstracts of the Renfrew Mercury. 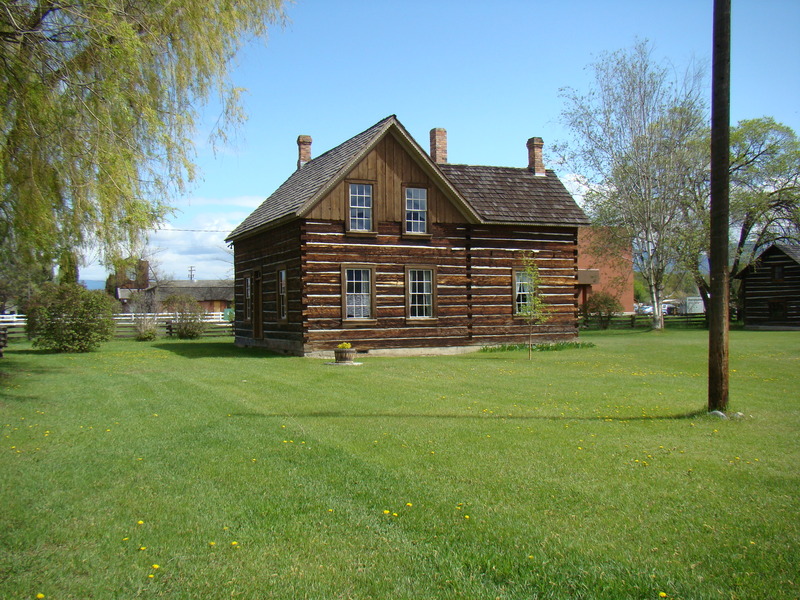 I did look at some Hastings County titles and a couple of church records. My cousin has studied most of these titles so I did not dig in too deep. They also had some Lambton county histories. So I was doing a mix of Brown and McDonald research. I had not looked at the library catalog so I was just pulling as I cruised down the stacks. I usually dig deeper into the holdings of a genealogical society as much as I can before visiting. We had arrived at 11 am and left about 2:30 pm so that means I did put some time into the reviewing of the books I pulled. I have documented in more detail what I did do using my camera to photograph the title pages and more. I will not go into the details here. Next door was the Bicycle Shop Cafe and we stopped there for some delicious sandwiches. They had old bicycles mounted on the walls. 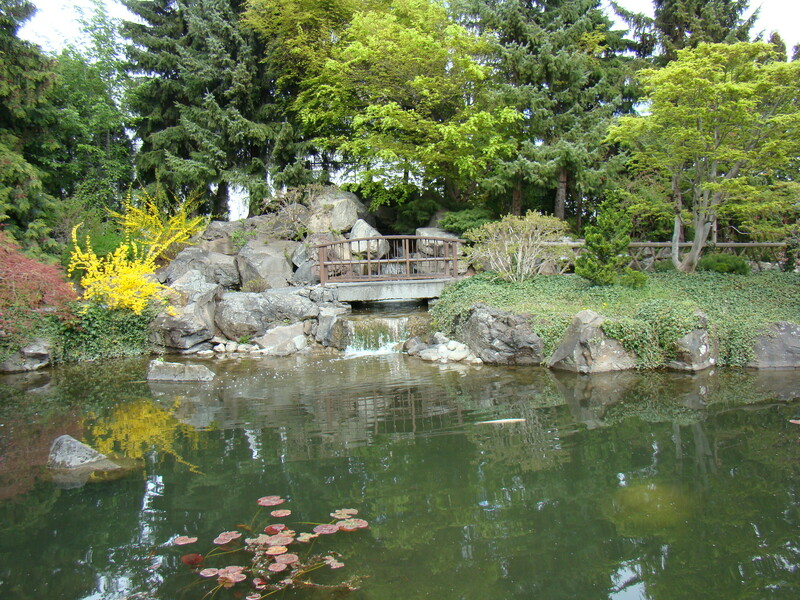 We dutifully followed my cousin down the street to the lovely Kasugai Japanese garden and spent a little time there. The Koi fish started to gather at the bridge over the pond probably thinking we were going to feed them. We did not. A lovely oasis in the city. 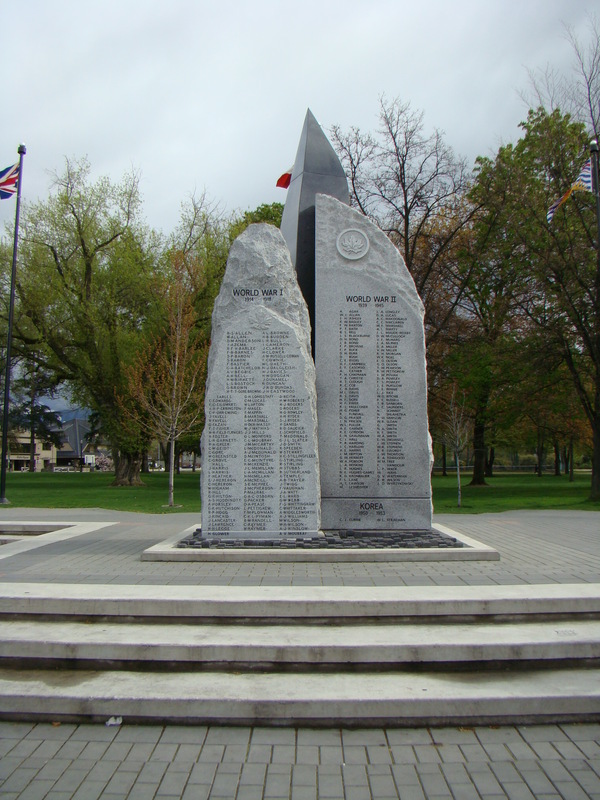 Memorial to those who served in City Park! 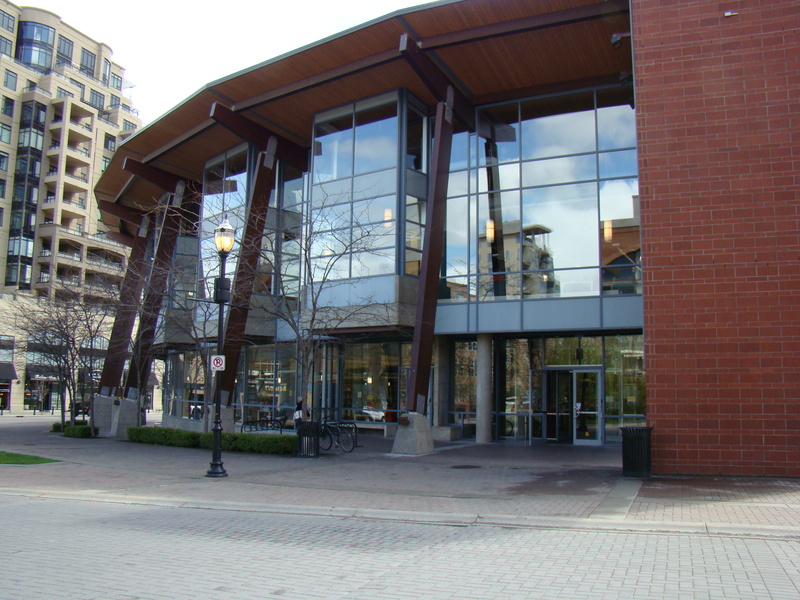 This entry was posted in British Columbia, BROWN Surname, Kelowna BC, MacDonald/McDonald surname, PAST GENEALOGICAL RESEARCH TRIPS and tagged Kelowna & District Genealogical Society, Kelowna BC, Kelowna Public Library on May 4, 2012 by BJ MacDonald. Surrey to Kelowna, British Columbia! 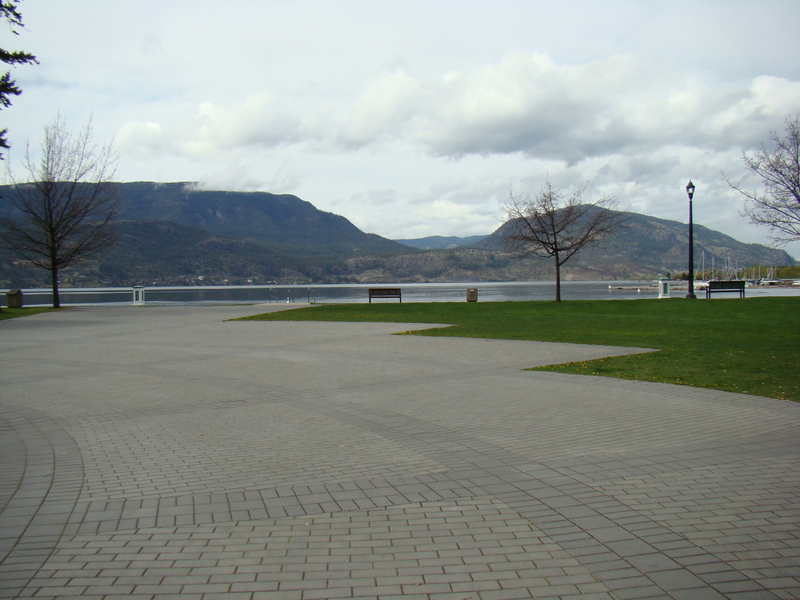 My goal was to visit Kelowna, British Columbia. My cousin, on the Brown side, had been born, raised and was still living there and I knew he had done a great deal of research on the family down from William Brown and Alice/Elsie Tymond. His line is the line of Matilda Jane Brown Clement a sister to my great-grandfather Richard Brown. 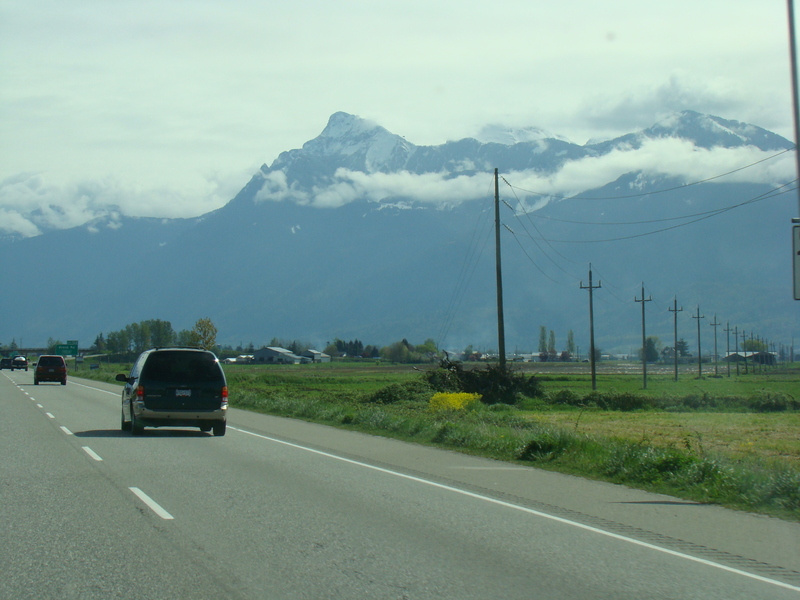 We headed east from Surrey to Abbotsford and then north to Chilliwack. There was this jagged pointed mountain that loomed ahead of us. After Chilliwack is the town of Hope. At this point you see signs encouraging you to get gasoline. My Streets and Trips had 63 miles from Hope to Merritt. Sorry but I am not into Kilometers yet! I did not realize that we would be climbing up to the Coquihalla Pass at 1244 m and there would be road side chain up areas. There was snow on the ground but fortunately the road was clean and bare. It is amazing country. I am going to try for some pictures on the way back. We arrived in Merritt about 12 noon so we stopped for lunch at a local pub on the main street. My hubby became interested in the TV screens with the card game and borrowed $2.00 (toonie) from me. He played a few hands. It was simulated with a carton flavor. 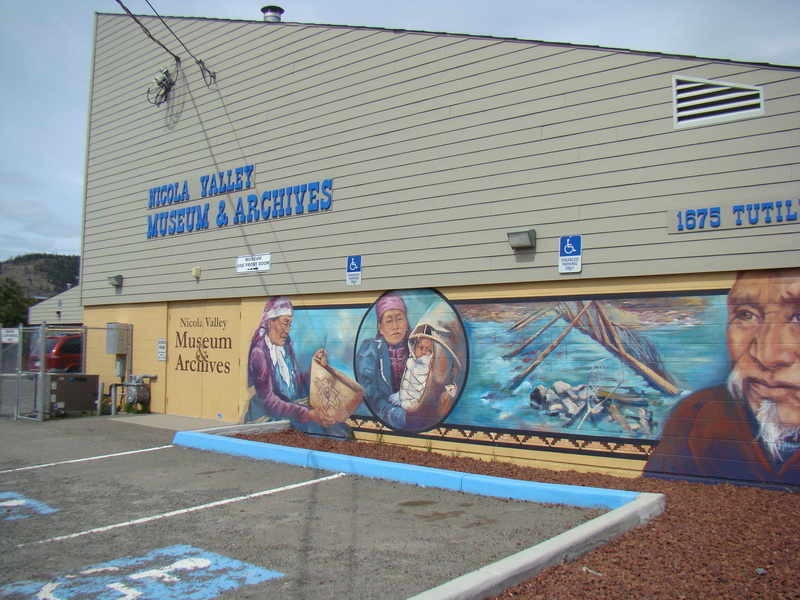 After our lunch we headed to the Nicola Valley Museum and Archive. There were these amazing murals on the outside of the building. 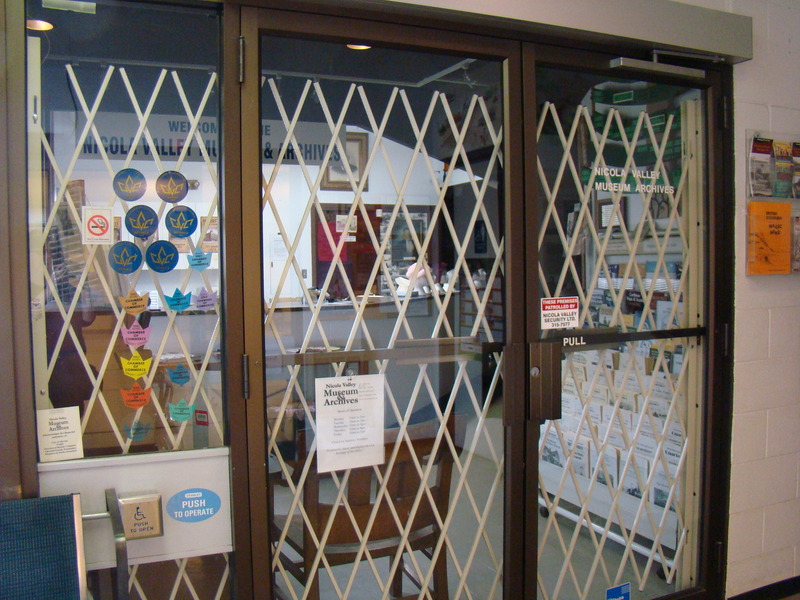 Unfortunately they are not open on the weekends. So we decided that me might try again on the way back. Merritt is nestled in this bowl surrounded by hills that still had some pine trees on them. There was this giant lumber yard in the center of town with piles and piles of logs. Our waitress looked like she might be what we call in the State’s Native American but here they refer to it as First Nation. The road to Kelowna was Hwy 97c and we headed east and again we climbed to another pass and it was another 60 miles. It was a good highway with very little traffic. The landscape reminded us of the Spokane area of eastern Washington. I felt very high up but the hills were more rounded with groupings of pine trees. The fencing along the road was a tall wire mesh rather than barbed wire and it stretched on for miles. We made great time and arrived in West Kelowna about 3:30 pm. We went from no traffic to a busy city environment. My hubby spotted signs for wineries so we took a turn off the highway and came to the Volcano Hills Winery. 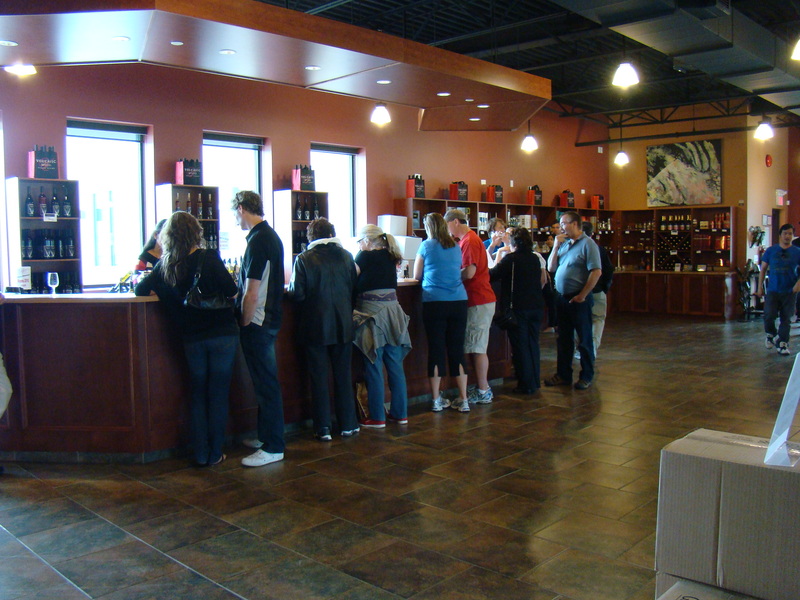 They had a nice store and tasting room. We liked their white wines and bought two Gewürztraminer. We didn’t remember how we got to the winery so we followed this road that took us back to the main road and across the floating bridge and over Lake Okanogan. It is a natural lake. My first impression of Kelowna was a busy main street much like Aurora at home. There were lots of stores, hotels, restaurants, highrise buildings, and more. Houses are perched on the surrounding hills. Hwy 97 heads east and then curves to the northeast and up past the Kelowna International Airport. Duck Lake comes up on the right. I did spot a few ducks on the marshy area at the south end. 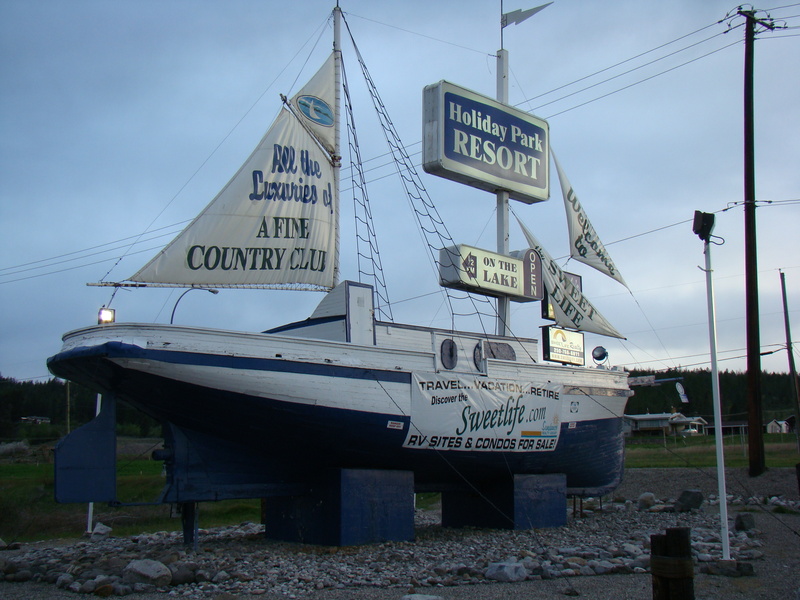 It was not too hard to find the Holiday Park Resort because they have this huge boat with sails out front announcing the resort. My hubby was telling me that they found this ship at the bottom of the lake, pulled it out and restored it. Later the resort purchased it for their welcoming sign. Holiday Park Resort is huge and is nestled on the north end of Duck Lake. 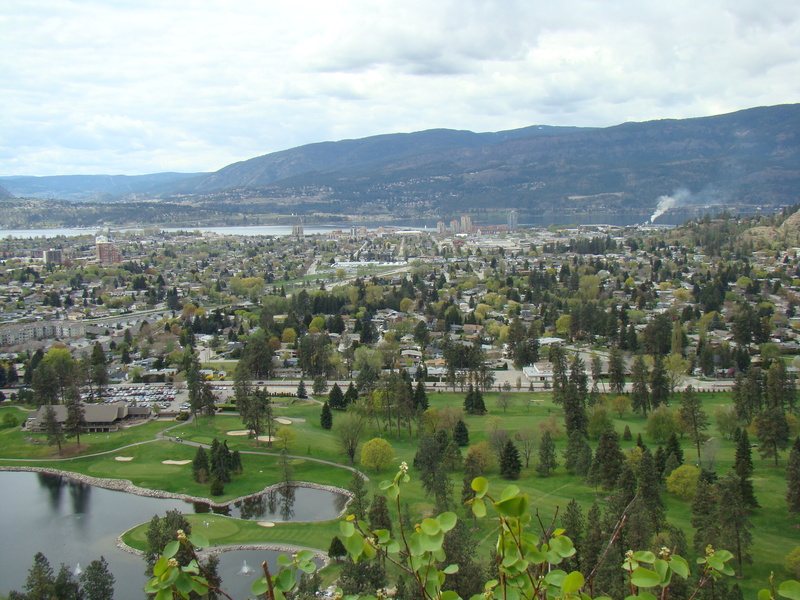 It is about 15 minutes from downtown Kelowna. Check-in was quick and fast. We found our condo and it is really nice with one bedroom but very roomy. The resort has two activity centers with an exercise room. There is not much in the grocery store just enough to get by. They do have a restaurant. Next door is another restaurant named Ricardo’s. The resort is not yet into the summer season so the pools are not ready to be used. It seems to be a combination of condo’s, permanent trailer park and trailer sites for those that come and go. It was full when we arrived but not so much a few days later. I am pleased, it is a very nice place to visit and stay. My cousin and I made arrangements to meet at a local restaurant for dinner in the middle of Kelowna. He was waiting in the lobby. A tall man with a beard and white hair, just like he said. We hugged and settled in at a booth. I believe we talked about everything: family, Canada, our trip up, his family, my hubby’s family and more. Bob had us follow him to his home which was not too far away and we were introduced to two tuxedo cats named Issy and Ozzie. They were very friendly. Bob is a collector of antiques and his house was nicely arranged to present his many finds. There were many wonderful family photos on the wall as well. We talked some more! It was a lovely end to a long but beautiful day. This entry was posted in British Columbia, British Columbia 2012, BROWN Surname, Canada, Matilda Jane Brown & Wm C. Clements, PAST GENEALOGICAL RESEARCH TRIPS, William Brown & Elsie Tymond and tagged Kelowna BC, Nicola Valley Museum & Archive, Volcano Hills Winery on May 2, 2012 by BJ MacDonald.